Today I was at Mass and there was this gentleman sitting behind me. He always sits behind me. I do not know who he is but he always comes to church by himself and that is the pew he sits in. I took it into my head that maybe I should bring this guy a missal, a prayer book. Because when I was new at the Latin Mass someone, an anonymous benefactor, gave me a missal. My life, welcome to it! Other people's lives are boring. But mine, I am the biographer of Leonard Pennario so my life is not normal. I have anonymous benefactors. Anyway, I get to thinking, this man of mystery behind me, he does not have a missal, and maybe he should have one. 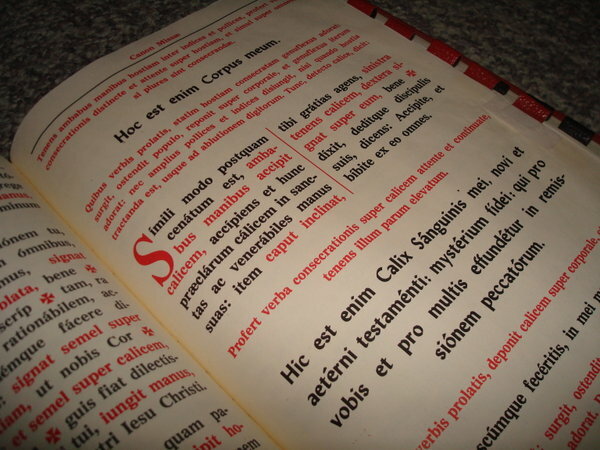 So I thought of this missal I bought at a garage sale a few weeks ago. I spent maybe $2 on it. I like to buy things like this up when I see them because I want them in good hands. I go home and I start chattering to Howard about my plan to give this guy, this stranger, this missal. And I find where it is on my dresser. And I opened it up and I looked at it closely for the first time. It is copyright 1951, with the imprimatur by Francis Cardinal Spellman, Archbishop of New York. It says on the cover "Saint Mary, My Everyday Missal." That is nothing special, probably, but what is special is how the person who had this book treated it. The missal appears to have belonged to someone who cared deeply about the faith and worked on it passionately over years and years. There are holy cards between the pages. The owner might have been Italian. Some of the cards are from the Maggadino Funeral Home in Niagara Falls. But that is only part of it. There are little typewritten notes slipped between the pages. There are tiny yellowed newspaper clippings. On the inside front cover is taped a tiny clipping reading: "The Blessing of St. Anthony is well worth memorizing, and repeating in time of temptation. It works like an exorcism against the devil." "Behold the Cross of the Lord! I had never heard that prayer but I will tell you this, I said it as soon as I read that. "Lord Jesus Christ, have mercy on me!" "O God come to my assistance! O Lord make haste to help me!" "Too late have I known Thee; too late have I loved Thee; O Beauty ever ancient and ever new." "Thou hast made us for thyself, O Lord; and our hearts will never rest untill they rest in Thee." St. Augustine. What a haunting and beautiful quote. The two l's in "until" are as they are written. I honestly got choked up. I thought: whoever this person is, he (or she) now rests in Thee. Well, you have to figure. The next few pages are covered in tiny fountain-pen writing. The missal's owner has written out Psalm 50: "David prays for the remission of his sins, for perfect sanctity," it starts. The psalm follows: "Have mercy on me, O God, according to thy great mercy. ... For I know my iniquity, and my Sin is always before me. ... For behold, I was conceived in iniquities: & in sins did my mother conceive me..."
It is beautiful handwriting. It is tiny but precise. There is not one cross-out on the page. I should take a picture. And the phrasing is so old-fashioned: "Create a clean heart in me, O God; & renew a right spirit within my bowels." That is sure not phrasing you hear very often! On the next page, another whole page of this precise ink script. It ends: "Look down, we beseech thee, O Lord, upon this thy family for which our Lord Jesus Christ did not hesitate to be betrayed into the hands of the wicked and suffer the torments of the Cross..."
This is incredible! All through the book are penciled notes: "Christ is called the desire of nations," is written on one Sunday. On Good Friday, where it says, "to His passion's deathly throes," the person has underlined "throes" and written: "the agony of death." Some of the pages have ancient Scotch tape. On August 7 (St. Cajetan, Confessor) I found an ancient sheet of paper folded in thirds and covered in Latin, written in fountain pen. I recognize some of the lines. I wonder if maybe the person served Mass and this was a cheat sheet. It is just a guess. There is a holy card inscribed to someone in 1928. And a narrow strip of paper with lines written on an old typewriter. "Christus vincit, Christus regnat, Christus, Christus imperat." Fascinating. Oh, and this is strange: There is a newspaper clipping about how you baptize a fetus, in case of miscarriage. The newspaper does not treat this as anything strange or morbid. There is even a jocular kind of type font over the headline, reading "What they ask us...."
You know what, I am starting to wonder if this missal was owned by a priest. It seems to have a lot of notes written in it, notes on the saints, the feast days. There is one note about what to do if you are celebrating the second or third Mass of the day. Well, one thing is for certain. I think this book is a keeper. Howard says you cannot give it to just anyone and I agree! I want to keep this, this prayer book owned by someone who loved it so much. I want to take it to church and pray out of it. That mystery man at church will just have to wait.